It's been many years, and the revision to Antiquity has been long needed. 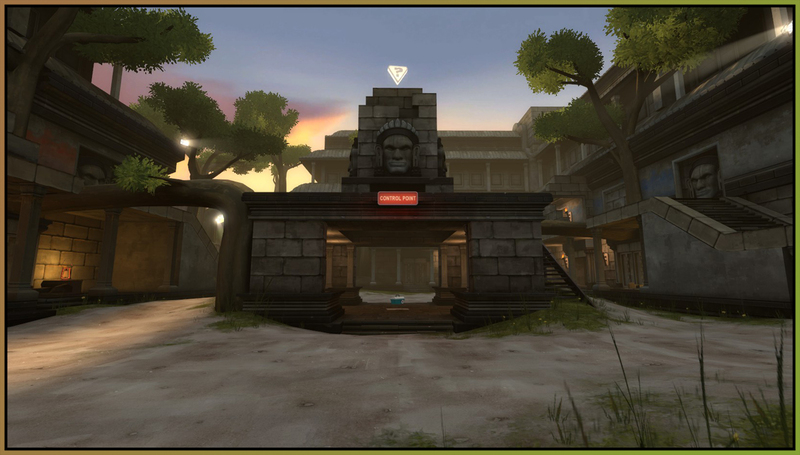 Not only to majorly update the aesthetics, but to also improve the gameplay. So far, I'm very happy with the new version of the theme, but as always, gameplay will require continued tweaks, changes, and iterations. This is something of a diary to explain my thought process throughout the revision. I should also note that the previous version was considered RC1 -- or 'Release Candidate 1.' 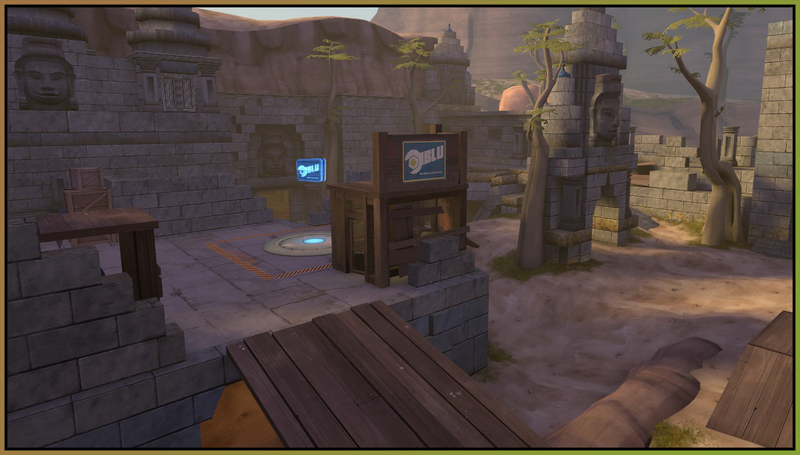 Obviously we've moved the whole map back to beta until we're sure it plays well in the new incaranation. Unprecedented, perhaps, but warranted! 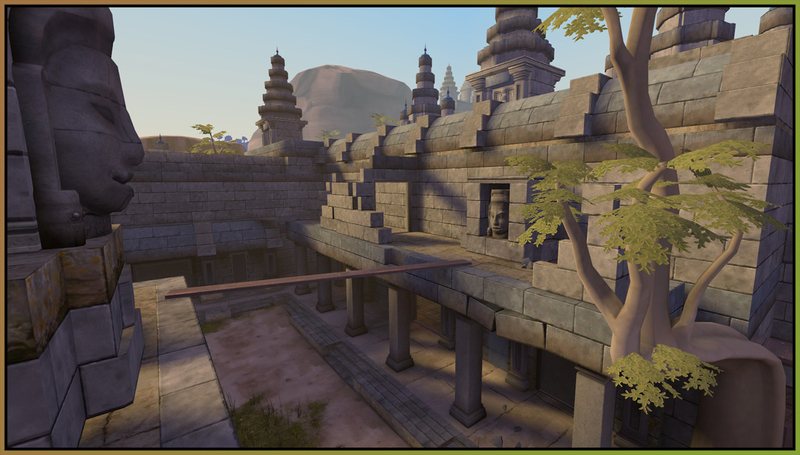 The most obvious changes to the middle point is the change in its overall height, but what might not be quite as obvious in the screenshots is the positional change of the control point itself. 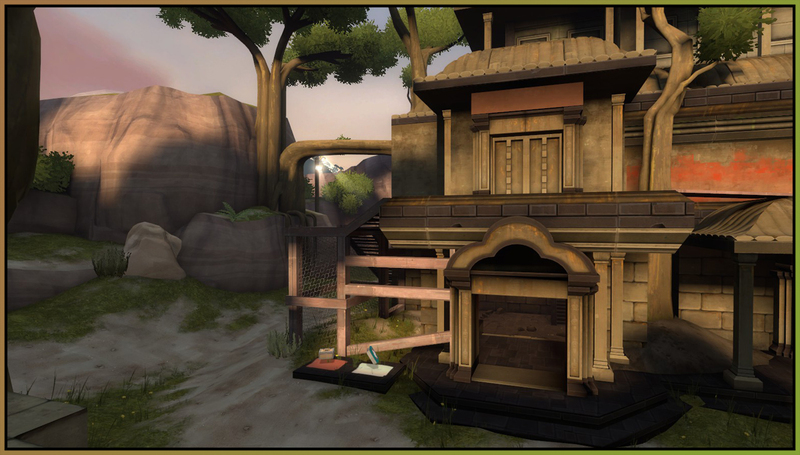 It's been moved from within the temple, to the top of it. This also required additional easier routes for the non-jumping classes. 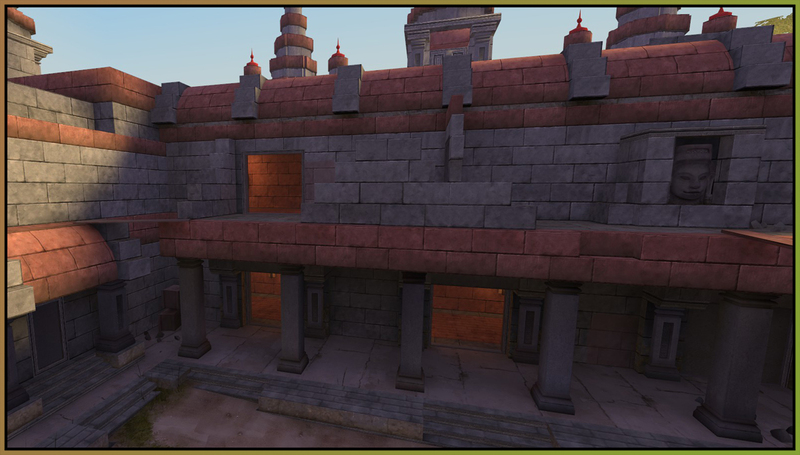 Since the inside of the temple is now mostly unused, it felt like a good spot for a carrot, to entice players inside or through. The large healthkit is likely too much for this purpose, so in later iterations will be downgraded severely. The pair of thin wooden planks that were the only access to the top of the middle point in the previous version were replaced with more robust and easier to use tree trunks. As a bonus, this also reinforced our Cambodian theme. 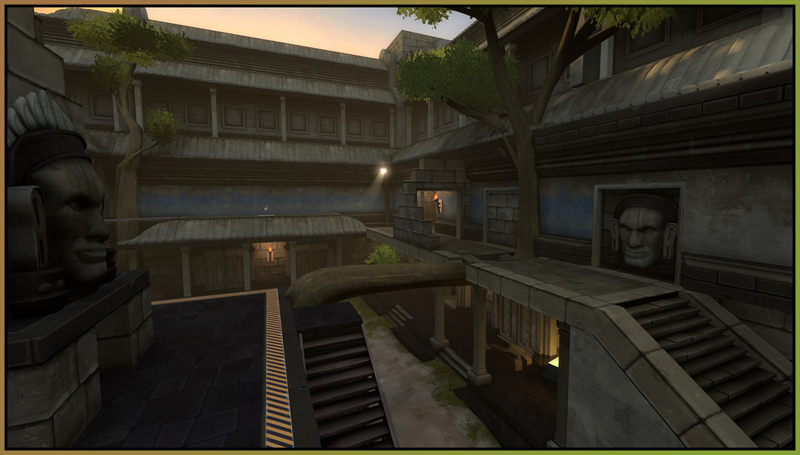 The previous version also had a minor jump sequence to reach the balcony. In the latest version, this was turned into a full set of stairs. No reason to beat around the bush -- we WANT players up there. What was previously a side room has now become a much more accessible side route. Removing one of the arches opens up the area tremendously, and even moving the garden closer still gives enough room for an additional balcony level access. The smaller route next to the garden was shifted over and now provides a direct route to the 2nd point, though this directness pays the price of being too much of a choke. 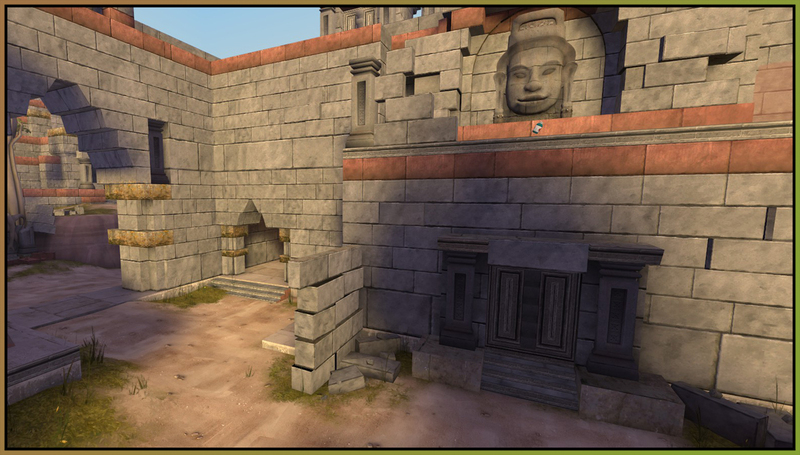 When Antiquity was initially made, this side area was blocked off by arches solely for optimization. It didn't feel very good going off into a large side room to reach the second point. As mentioned, this was opened up to make the flow better. In addition, the pickups that were located in this area were removed, as they were redundant -- there's a medium set at the second point just beyond the archway, and another medium set at mid by the new stairs. Several doors provide access to and from the interior rooms of the ruins structure. Players found the columns annoying, so this was addressed by reducing the thickness of the columns and also reducing their number. In the old version, strongly coloured stone on the inside walls starkly marked the entrances. 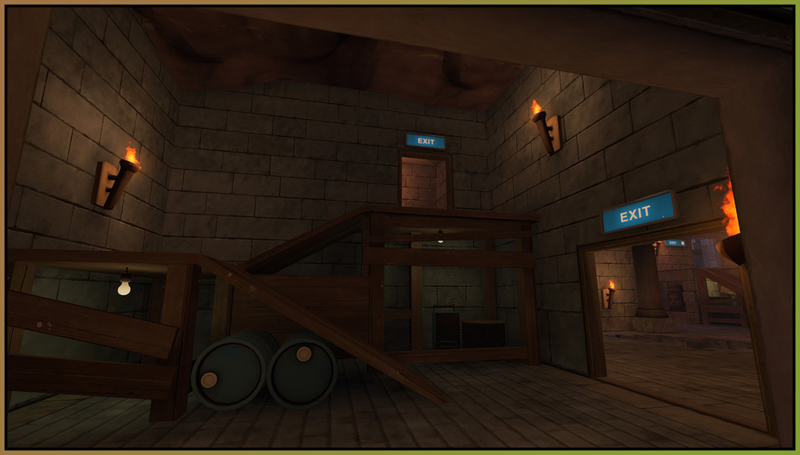 The new artstyle is not quite as on the nose, so torches were added to the entrances to draw attention to them. Players (myself included) hated the ditch at second. It served no point other than to put you at an accidental disadvantage when you backed up into it, so it was totally removed. 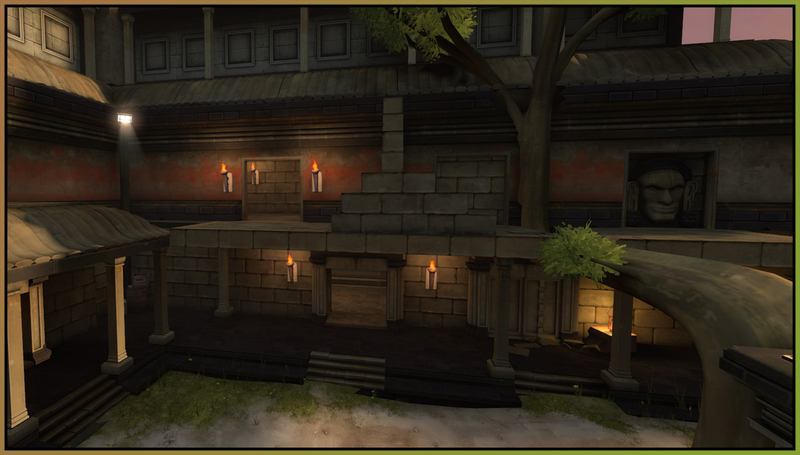 Also removed was the decorative structure which only blocked sightlines. This purpose is more elegantly served by raising the second point and placing one of the large banyan trees nearby. As well as helping with the sightline, raising the second point also makes it more defensive against retakes while slowing down overwhelming pushes from mid. 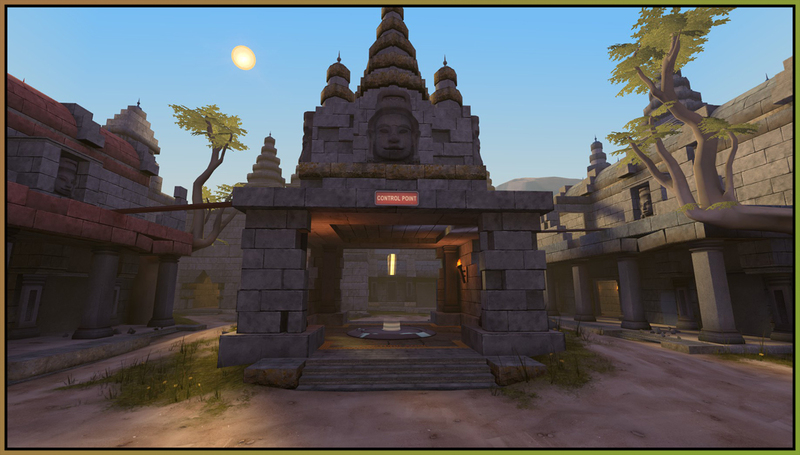 One of the goals for this area was to open up the area and provide more vision for the various entrances. A more direct route with better visibility was added along the top, and the area beneath the stairs was made more open. After playtesting the new version, this will need further tweaks, but it's a strong step in the right direction. 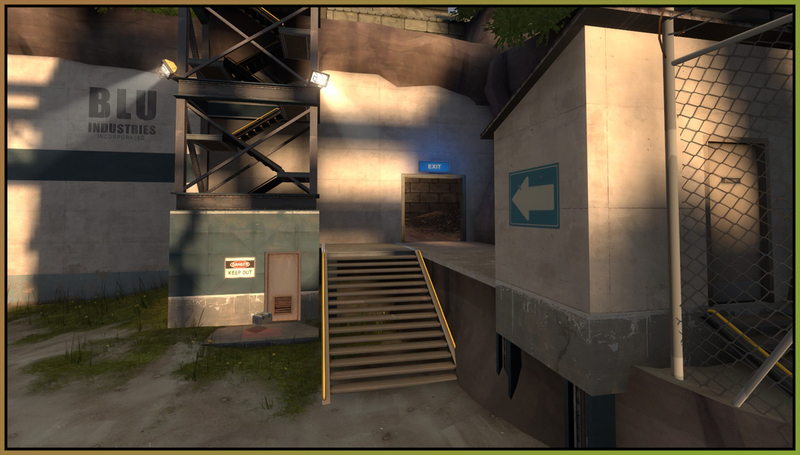 The flank route in the old map actually worked fairly well, but it was too far removed from the main pathways and consisted of too many separated rooms. 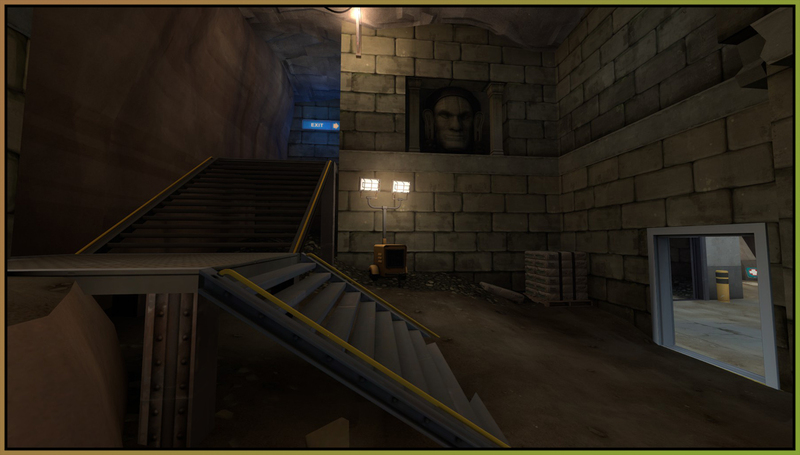 Two of those rooms were combined into the new stairway room, and the health kit was upgraded to a medium. 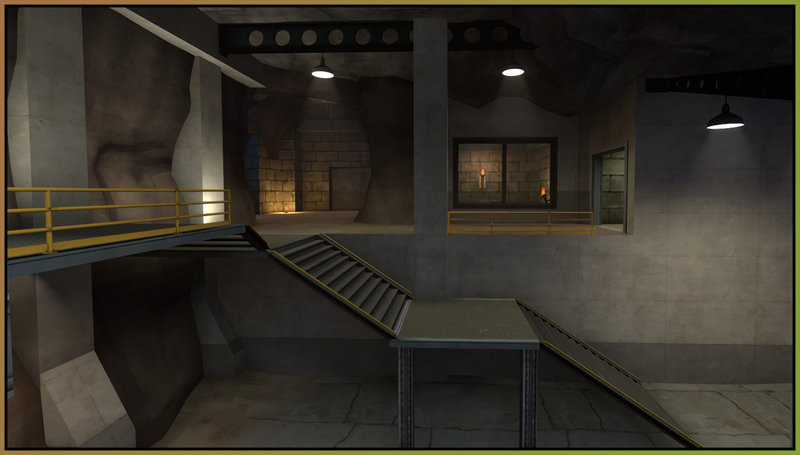 The stairway now keeps players pointed roughly forward rather than having to doubleback. One of the most used entrances and exits turned out to be this upper side route. Unfortunately there were a lot of problems with it. 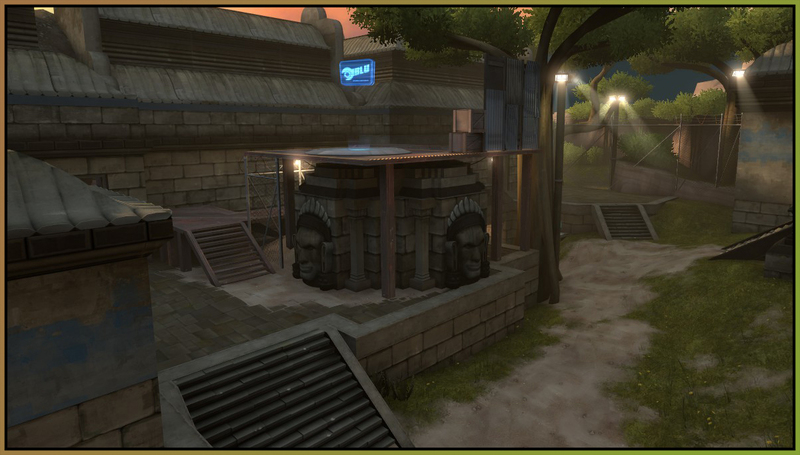 Players would take damage dropping off the side, the cover was essentially barrel-prop spam, and it provided a huge advantage to attackers. All of these were addressed in the new version. 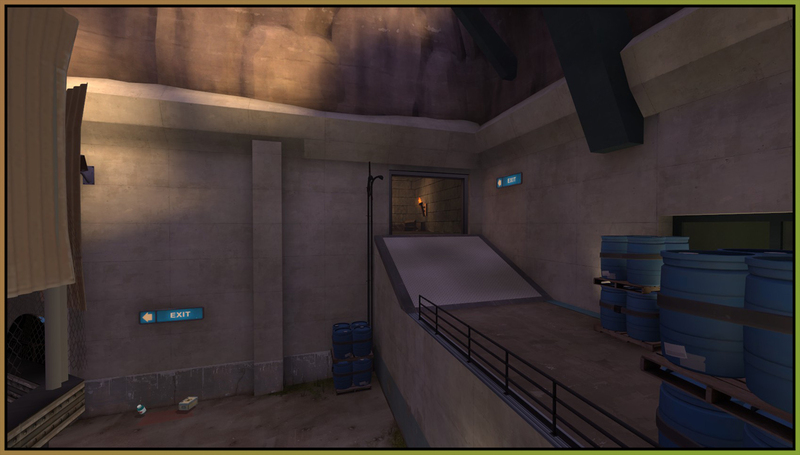 The walkway has been lowered, the cover is much more simple, and the route now drops to ground level instead of running directly into the defender's spawn. The small health kit here was also moved closer to the main entrance as a carrot for both defenders and attackers using that route. Big changes happened at last. 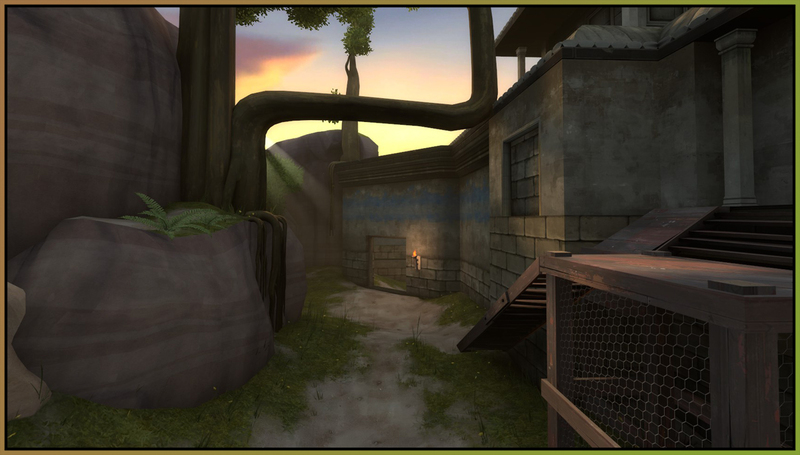 Aesthetically, a lot of the walls were converted into out-of-bounds zones to make the entire area feel more open. 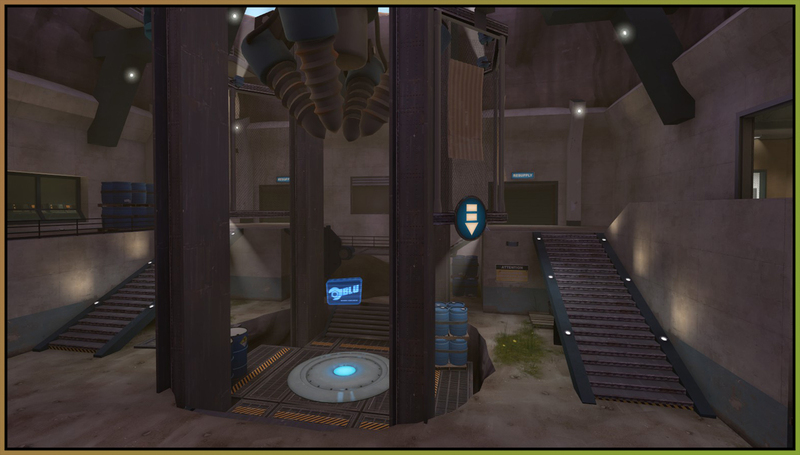 Players didn't like having to drop down onto the final point to capture or defend, so the capture area was made split level. This is an experiment -- we'll see how it works out. 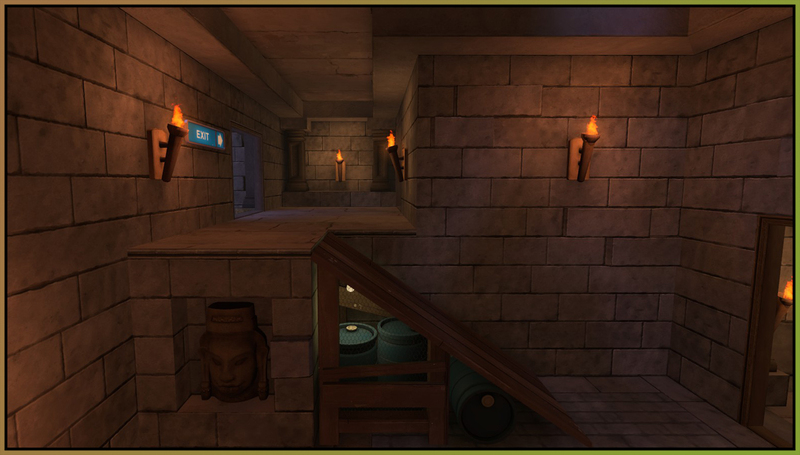 The spawnroom has been condensed, letting players rotate more freely between the exits as needed. 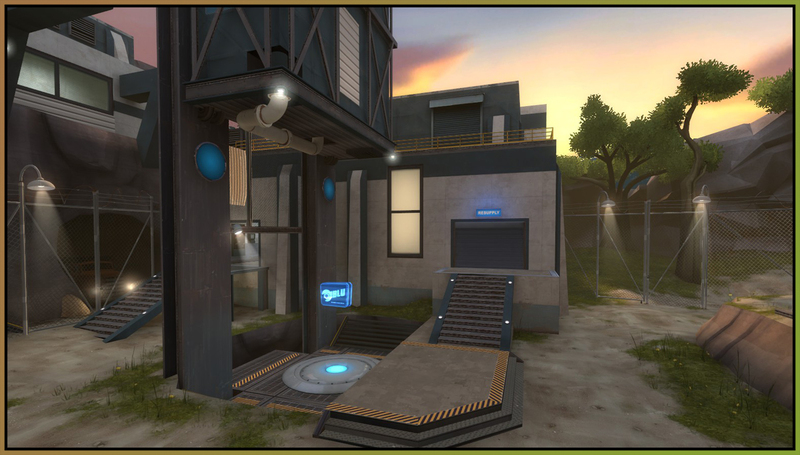 Sentries were a problem here, so the large drill structure was effectively cut in half and the walkway behind the point removed to reduce the number of potent sentry locations. 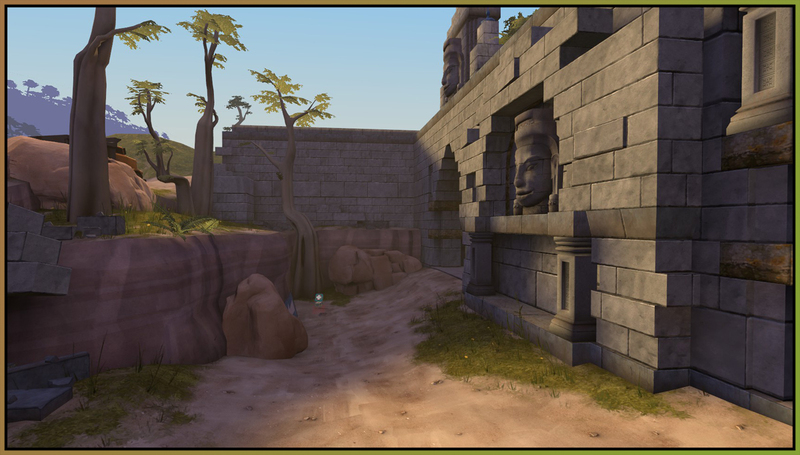 The odd flank route that came out so high above the final point was removed and a new flank exit placed further away.